One of the best, if not the best, ways to prevent automated web robot tools and spammers from taking advantage of your forms and scripts is by using a captcha image. Here is a simple example that I hacked up earlier today to use on my Advanced Request and Response HTTP Header Viewer among other tools. View a working example on my Advanced Request and Response HTTP Header Viewer tool. 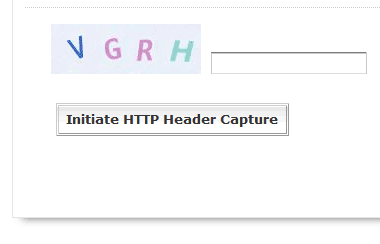 Save this on your site as capya.php and include in your php script with require_once 'capya.php', then run with askapache_captcha(); which outputs XHTML of the captcha image. To verify a user-submitted (via POST or GET) value for the captcha image, do this.